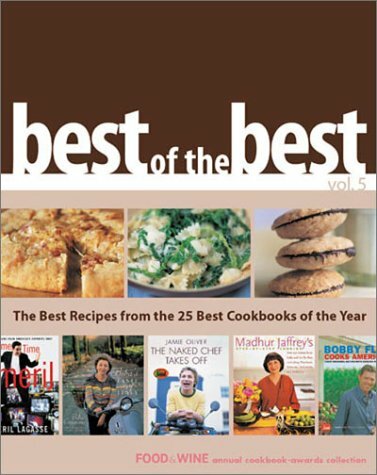 Buy only one cookbook this year--and get all the best recipes published this year! Almost 1 million subscribers heartily agree: Food & Wine is the unrivaled leader in the field, and every year their editors search tirelessly for the most delectable dishes from the creme de la creme of cookbooks. Here are their selections-from such top chefs as Emeril Lagasse, Jamie Oliver (The Naked Chef), Bobby Flay, Charlie Trotter, Danny Meyer, and Madhur Jaffrey-now fully kitchen-tested. Prepare something incredible from one of the Editor's Choice Award titles, like Hazelnut Chocolate Meringue with Blackberries from A Year in Chocolate by Alice Medrich, named Prettiest Book. Don't miss the Ecuadorian Potato-Cheese Soup with Avocado from Home Cooking Around the World (David Ricketts), winner of Best Recipe: Savory. And for a truly unforgettable meal, select a dish from Tina Salter's Nuts--the all-around Best Cookbook of the Year. Plus: Joanne Weir, host of PBS's Weir Cooking, offers a tasty Slow-Roasted Beet Salad with Parsley, Celery and Fennel, and Emeril helps you kick it up a notch with Lobster Portuguese-Style or Country Fried Steak with White Gravy. Each recipe will tantalize you on the page, just from the photos and the descriptions. Imagine what they will really taste like on your plate.